Each year since 2011, we have invited children to bring their teddy bears or other special stuffed animals to the Museum of Health Care's Family Day Programs. 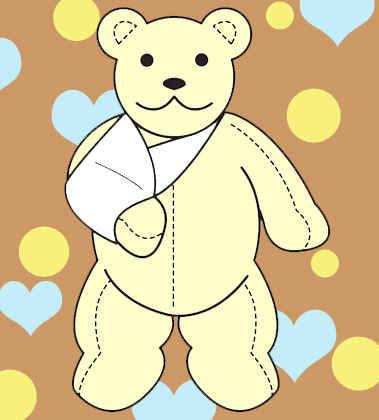 Our trained teddy doctors and nurses were on hand to examine and treat the beloved toys' bumps, lumps, and bruises (both real and imaginary)! Children and adults enjoyed learning, laughing, and discovering why doctors and hospitals aren't so scary after all! The events featured a special storytime, tasty snacks (including teddy bear-shaped cookies provided by Card's Bakery), and craft and colouring activities. Children also enjoyed handling real medical instruments from the Museum's education collection, as well as a toy doctor's kit and other hands-on items provided by KGH Child Life Services. This program was offered 2011-2016 to children aged 3-8, with adult accompaniment. Click here for photos from our 2017 Teddy Bear Hospital Family Day Programs.